When I saw a few questions on my son's Everyday Math homework about median, I was psyched. 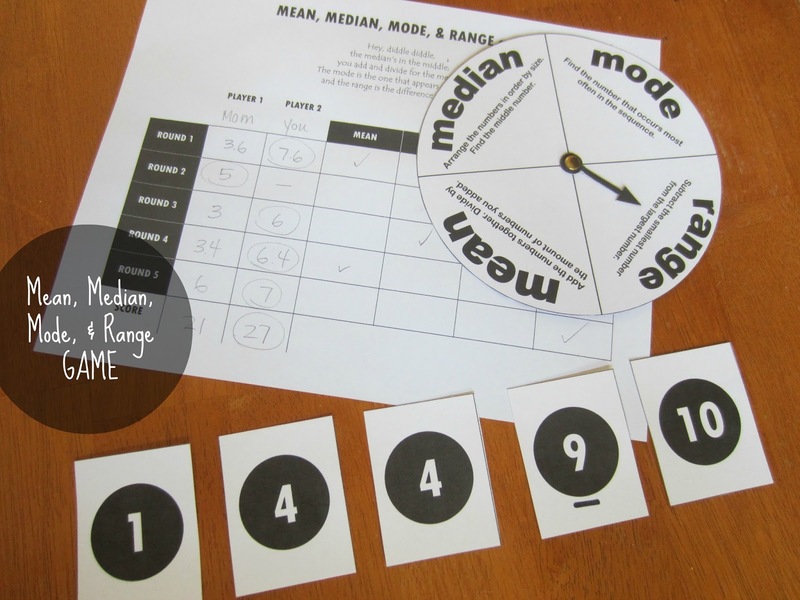 Creating a game to practice calculating mean, median, mode, and range was a snap. And, boy oh boy, was it fun to play! Kids practice SO many skills with these calculations - ordering numbers for median, addition and division for mean, and subtraction for range! You can print our game here. The 4-page PDF contains 3 sets of numbered cards (1-10), a spinner to make, and a scorecard. To make the spinner, I printed the template onto a piece of sticker paper. (Don't have any? Use a glue stick instead.) I stuck it to the brown side of a recycled cardboard cereal box. Then I cut it out, punched a hole in the middle of the spinner and the arrow, threaded a brad through both and loosely (so it spins freely) separated the prongs on the brad at the back of the spinner. I printed 6 sets of numbered cards (2 copies of the two pages in the PDF) onto heavyweight cardstock; truthfully, I only needed five sets, but since I'd designed the layout to feature 3 sets on two pages, printing extra was inevitable. Want to save some printer ink? Forego this download and grab a deck of cards. Use aces as 1s, and eliminate the kings, queens, jacks, and jokers. 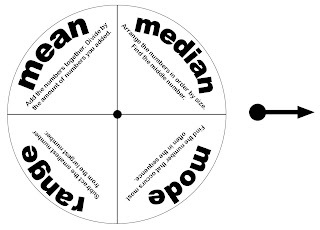 Instead of a spinner, decide which you'll calculate for each round (mean, median, etc.) 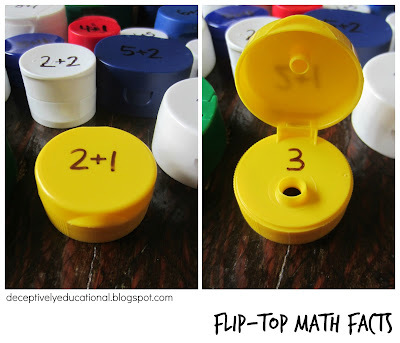 and use scratch paper for score keeping! I dealt five piles of five cards each face down in front of my son and I (i.e. we both had 25 cards in front of us in five even piles). 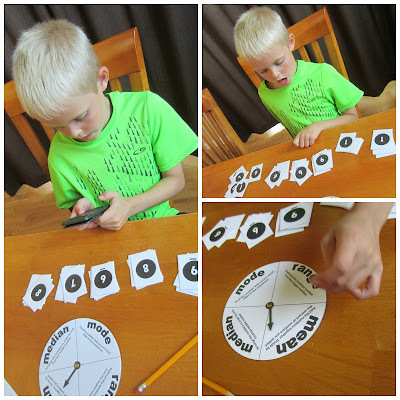 For each round, we took turns flicking the arrow on the spinner. Next, we turned the cards on top of each of our piles over. If the arrow pointed to mean, we each figured out the mean (he used a calculator). We checked the box on our scorecard to indicate that Round 1 was mean, wrote down our two scores (the number resulting from our calculations), and removed the cards from our piles, setting them aside, so we could prepare for Round 2. After five rounds of play, we totaled our scores. The player with the highest number wins! I love the rhyme - it makes all these terms so easy to remember. Great game too!